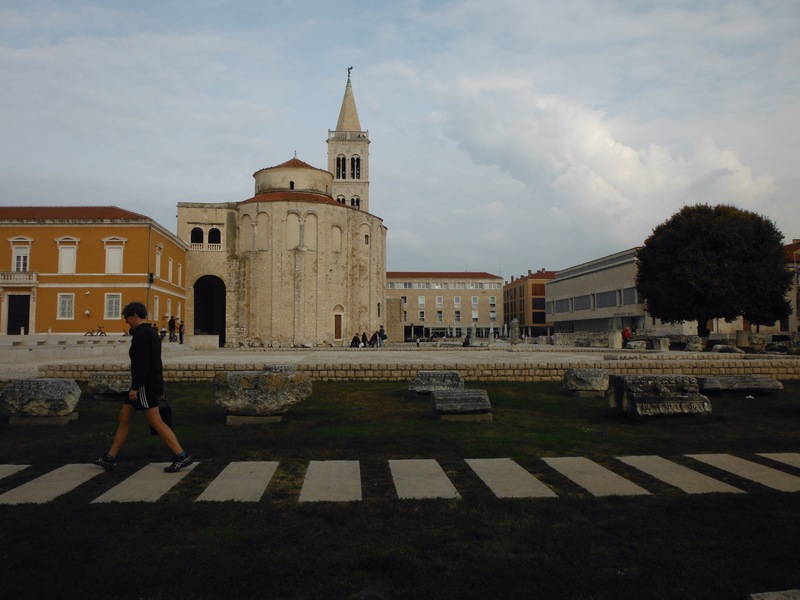 Zadar is famous for it’s sea organ, a stepped area on the sea with a mass of pipes underneath that make sea noises as the waves splash the stone steps. It really is a bizarre experience, and when the ferry goes past it makes more of a deafening boom than soothing sea tones. I went to see it whilst Debs experienced Croatian public healthcare. After reading an entire novel it was established that yes she would need to come back tomorrow to see an eye doctor. On the way home we spotted a cinema and having learned that films are shown in English, went back for a later viewing of Spectre. The second hospital visit was much faster than the first so we enjoyed an afternoon off in Zadar (I couldn’t keep the sea organ experience to myself). The town also has a number of Roman ruins, though interestingly they have not been left where they found but dug up and arranged in neat patterns in the centre square. It was pretty cool to be able to wander around chunks of old stuff and go up the bell tower to view it all from above. Peace was shattered temporarily with the Saturday ritual of Croatian Wedding Drivers coming in and out of the city, reminding us what day it was at least. 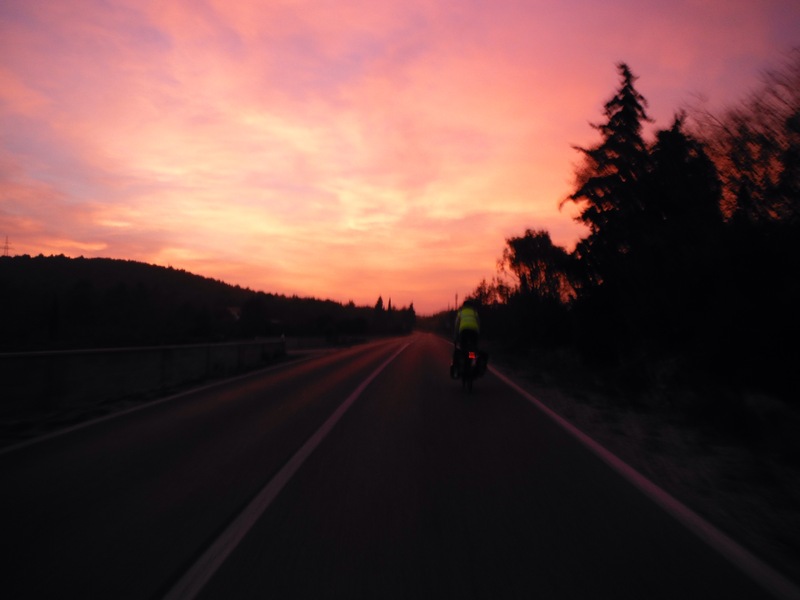 From Zadar it was a 100km ride down the coast to Krka National Park, our substitute for not being able to detour inland over a huge mountain range to go to Plitvice Lakes, the most famous Croatian park. 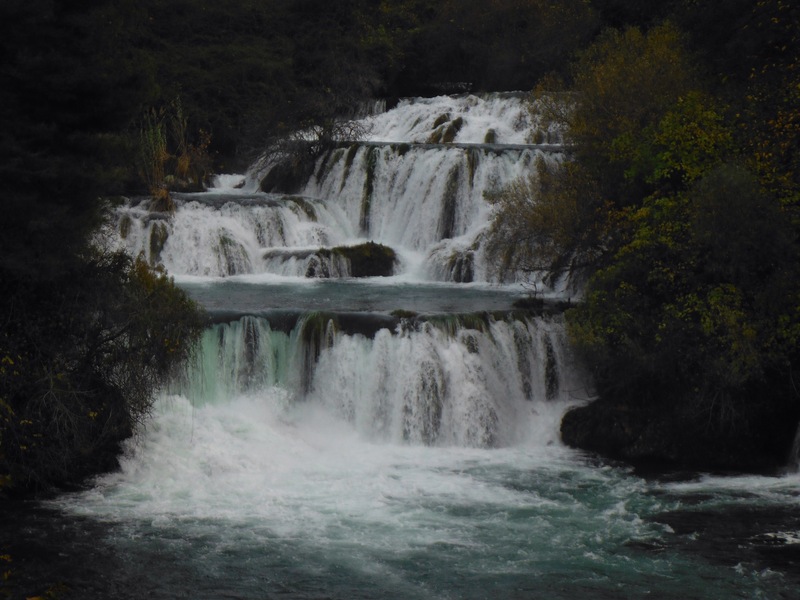 It’s hard to compromise sometimes, but you can’t possibly see everything in a country when travelling by bike – Krka has some very impressive waterfalls itself, we arrived at the park less than an hour before it closed and the falls were at the bottom of a long, hairpin descent. The ranger seemed to think it wouldn’t be a problem for us to ride down and back up again in time – he has clearly never ridden a loaded bike uphill. We zoomed down there in 5 mins, had a walk around the falls and then it took half an hour to get back up sweating like crazy, arriving back at the gate a respectable 25 mins after the park closed. So as usual we had a race against the daylight, which as usual we lost. Next up was Split, Croatia’s second largest city that we were only visiting to catch a boat to our next island. On the way we called at Solin, the impressive ruins of a Roman town located next to a busy dual carriageway and industrial area of Split. Peaceful. We got in free for being cool bike travellers (maybe) and were then swamped by a group of school kids practicing their English. ‘My name is … ‘ is about as far as they have got with English but they knew how to repeat it again and again. At least they recognised the Union Jack – most kids seem to think we are American. C’mon kids, it’s a very different flag! Split itself challenged for the ugliest city award as we rode through miles and miles of busy, grubby suburbs – luckily it improved dramatically on reaching the historical area where the Diocletian Palace covers most of the centre, with lots of small cobbled streets which is probably fun if you are not pushing/riding a loaded bike. The next island on our agenda was Brac, producer of white stone used in many buildings including the White House itself. It’s one of the lesser visited islands but was probably our favourite – small towns that were not particularly touristy therefore still had life in them out of season, quiet roads that either hugged the coastline or took us up mountains for amazing views and very empty and peaceful in the middle. Back on the mainland, we were excited about getting to Dubrovnik – one of the few places we had in mind to definitely visit. Although there were several more ‘must-see’ islands on the way, as the forecast was for cloud and rain for a few days these were regrettably bypassed in favour of a city with more potential for rainy day activities. 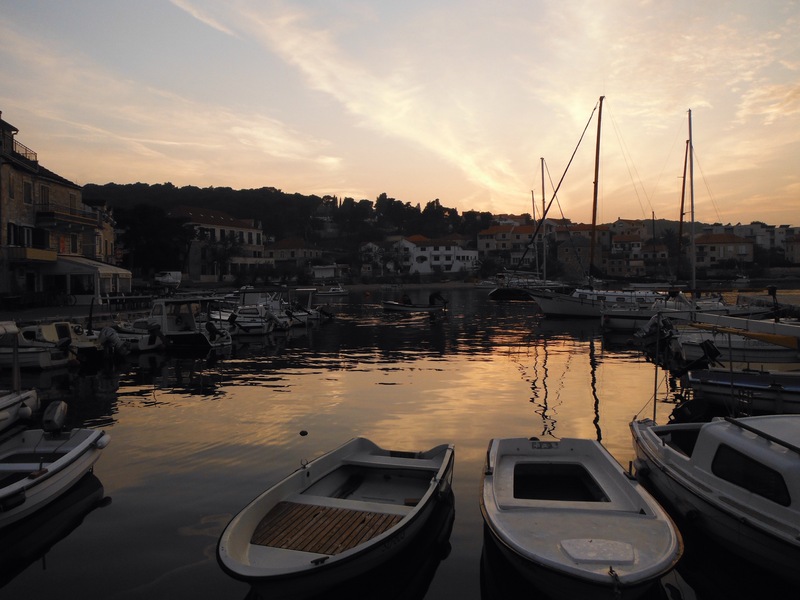 Next time, Korcula, Hvar and Mljet. It would also be the fist time we spent more than two nights in the same place in 8 weeks – much needed by this point. 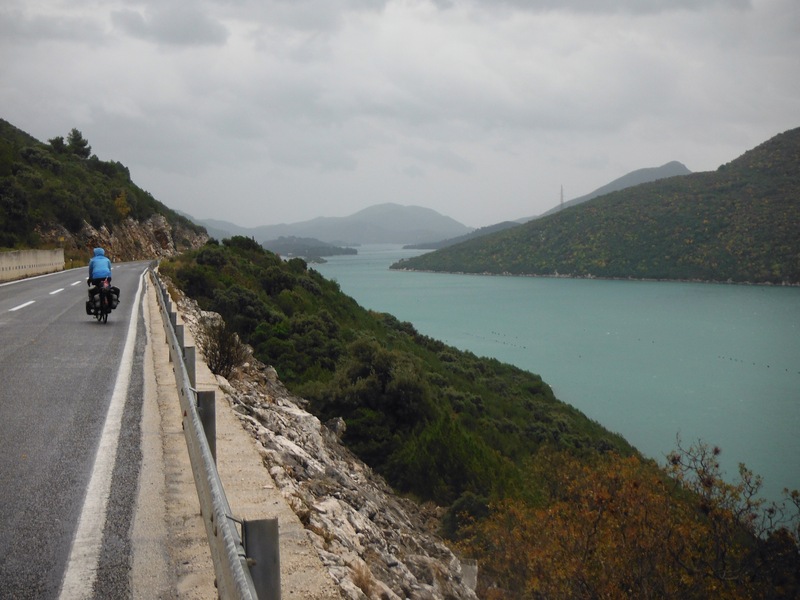 The ride into Dubrovnik was the most spectacular section of the coast road, unfortunately it hammered it down for most of the day. 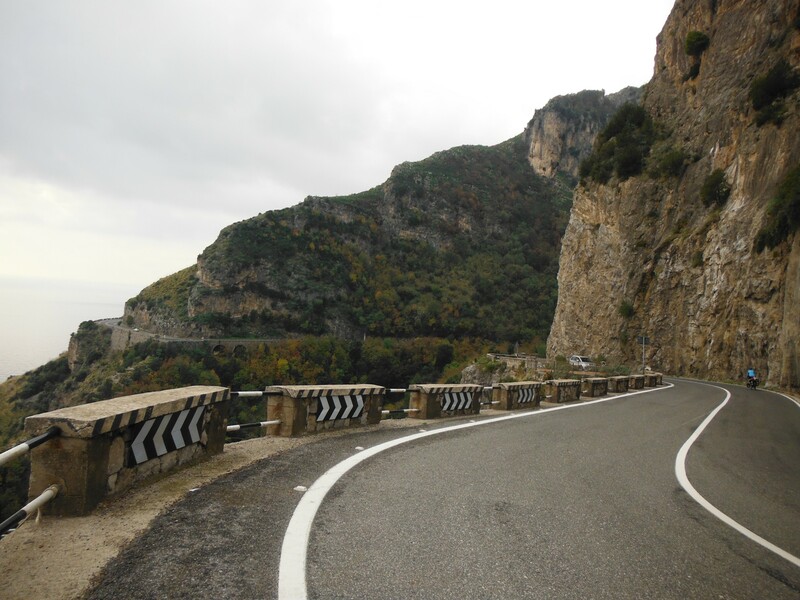 So instead of coastal scenery being the highlight, that day will be remembered for the 10km section of Bosnia (country #11) that the coast road goes through. But not for scenery, people or culture (though I’m sure these are all great when it isn’t chucking it down), but for food. Not wanting to pass through a new country without stopping, and starving and wanting a note for our map wall we took out the equivalent of about £7 from an ATM and went straight to a roadside bakery where £3.50 bought us a pile of pastries. We had become fond of the burek since discovering it in Croatia – a long thin pastry filled with either cheese or meat and rolled up – and the Bosnian one was our best yet. So we sheltered from the rain by a posh hotel where Japanese tourists ran into from their coach (not quite sure how they sold them ‘lunch in Bosnia’ as a highlight of the day, and in the rain it did not look it’s finest) and stuffed ourselves. Most cyclists on this route will ride in and out of Bosnia in about half an hour, we took almost two, most of which was spent eating. What’s not to like? Finally we reached Dubrovnik, drenched and cold for the first time in weeks. The rain was like rivers on the road and threatened to wash us away at times. But the next morning we woke to sunshine so headed straight to the city walls. I love a good walled city and this is one of the finest out there as every corner of the wall offers an amazing panoramic view of the city and the sea. Being out of season tourists came in our favour as we practically had the walls to ourselves, after seeing pictures of how crowded they get in the summer this was very much appreciated. Although strangely one guy managed to get in all the photos Debs took for one five minute period – I had to commend him for such an achievement given the lack of people around. 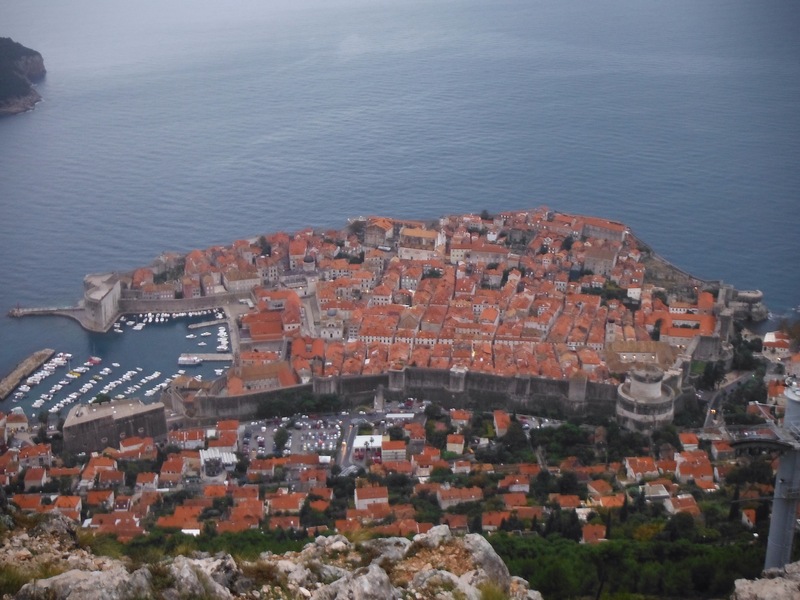 We ended up staying in Dubrovnik for 4 days, 3 of which it rained, and 2 of which we did very little (the only thing we scheduled for the last day was ‘take advantage of coffee and pancakes offer between 12-8pm’, suggesting to us that it was time to leave….) It’s a very ‘pleasing to the eye’ city, not wanting to be overrun by tourism none of the shops are allowed signs so they have the shop names inscribed on lanterns and on tabards which sets it apart from the rest of the country where you can’t move for adverts obscuring every view. It’s also amazing how the city has recovered from the heavy bombing it received during the Yugoslav war, it was quite sobering to visit some of the museums and learn more about a war that killed so many people yet was so recent I was in secondary school at the time. We sat and watched some BBC news footage from the time, captivated by images of buildings we had just walked around being shelled as well as the soothing tones of an English accent and full sentences we could understand. We had high expectations of Croatia, and the scenery didn’t disappoint. Being there out of season was a little frustrating at times but also worked to our advantage with quiet beaches and cheap hotels (we didn’t sleep in the tent once, it just wasn’t worth the effort). The driving was a bit crazy and being on the phone whilst driving seems to be standard practice – we saw drivers watching videos on their phone. The people were perhaps the least friendly of all the countries we had been through (and have since) – not that they were unfriendly but there was not the warm welcome that we have experienced elsewhere. Interacting with people is difficult with the language barrier but usually we have some semblance of a conversation with local people several times a day, or at least a smile and a wave – in Croatia we were invisible. 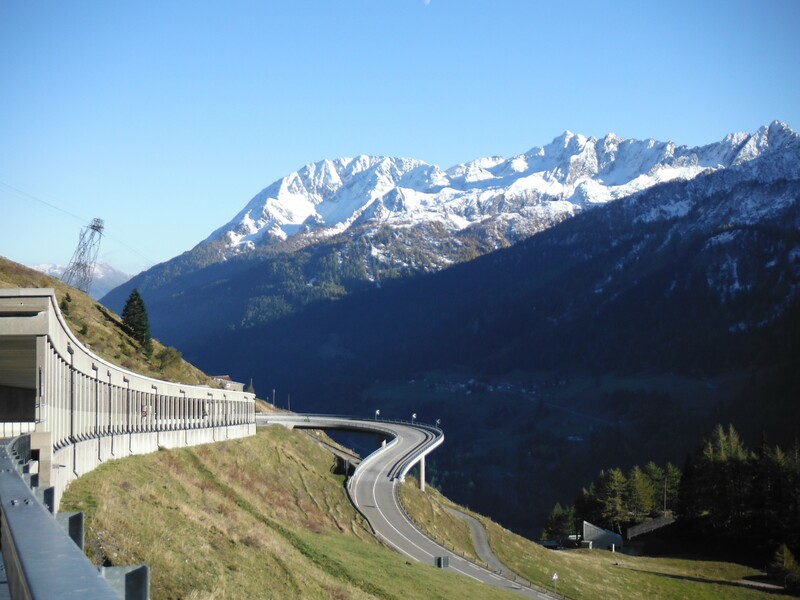 Probably so many people pass through on bikes in the summer that it is not of interest, and in the winter they just want their towns back for some peace and quiet before the season starts again. Understandable I guess! Thanks to Frane #1 in Kastel Lucic and Frane #2 (and his family) in Pucisca for their hospitality, and the friendly guys at Extreme bike shop in Split for sorting us out with some essentials.